Surprising success with “Little Talks,” tour and album for young Arcade Fire fans. Iceland’s sextet Of Monsters and Men, led in part by Nanna Bryndis Hilmarsdóttir, top centre, sold out their visit to Toronton and made a surprise trip to the top of the iTunes Canada chart while doing so. The number of successful Icelandic music exports that have had seismic impact in North America can be counted on a few fingers of a single hand. There’s house music specialists GusGus; ethereal rockers Sigur Rós and alternative rockers The Sugarcubes, which begat eclectic performance art and swan-dress fashionista Björk, the biggest of them all with over 15 million albums sold worldwide. But with the rapidly growing popularity of the impeccably catchy and strident “Little Talks” — recently added to local tastemaker radio station The Edge’s playlist — and a string of sellout dates that included last week’s Toronto concert debut at The Phoenix, Of Monsters And Men are pushing to add to that legacy. Hailing from Gardabaer —a town (pop. 10,909) that might be considered a small suburb of capital Reykjavik — Of Monsters And Men is a relatively new entity in the folk pop sweepstakes. “You can’t be over 25 to enter, but young bands often go and form around this competition,” says Hilmarsdóttir, 22. Of Monsters And Men won the 2010 competition, and received studio time and ended up performing at the Iceland Airwaves festival, where a Seattle radio station taped their rendition of “Little Talks” and got the viral ball rolling, eventually leading to a deal with Universal Music and the recording of their first album, the Jacquire King-produced My Head Is An Animal. If energetic songs like “Dirty Paws” and “King And Lionheart” conjure up sonic references to Montreal’s Arcade Fire or England’s Mumford & Sons, it’s not your imagination. “They definitely were influences,” agrees Hilmarsdóttir, whose band is rumoured to be returning to Toronto in August. “I like Mumford & Sons just because of the atmosphere the band creates and Arcade Fire have their own crazy vibe, this energy that you just want to embrace. 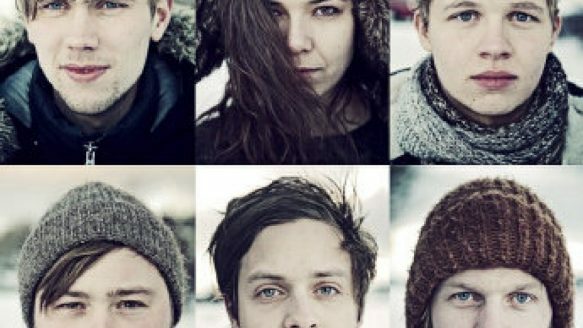 Be the first to comment on "Of Monsters and Men another Iceland hit"